Spider-Man will let you play hero for a day, but be ready to fight with the game's weaknesses as well as its villains. Once bitten, twice the guy. Thanks to the bite of an irradiated spider, budding boy genius Peter Parker suddenly finds himself turned into a superhuman with the powers of a spider. The rest is comic book history. As the Marvel Comics superhero Spider-Man, Parker has been entertaining legions of fans for 40 years through a string of comic book titles and animated series. If the Spider-Man game is any indication, the general love affair with all things Spidey burns as brightly as ever. Originally developed by Neversoft, the developer behind the hit Tony Hawk's Pro Skater series, Spider-Man first swung its way onto the PlayStation, and soon leapt to the Nintendo 64, Game Boy Color, and Dreamcast. Now the third-person action-adventure game has come to the PC to make true believers out of computer gamers. Along the way, though, it's run into a few snags that often dampen the game's more entertaining aspects. He story, told through cutscenes, voice-overs, and in-game dialogue, opens at a conference held by the renowned Dr. Otto Octavius, who's preparing to demonstrate his latest invention. While the good doctor pontificates about the virtues of progress through technology, Spider-Man suddenly leaps onto the stage and makes off with Octavius' device before the assembled crowd. Since the real Spider-Man, Peter Parker, stands among the members of the press taking photos for the Daily Bugle newspaper, it can only mean an imposter is at large and ruining Spidey's already tenuous reputation. Parker's jealous journalistic competition at the Bugle, Eddie Brock, also witnesses the shocking event. The fact that Octavius is really the supervillain Dr. Octopus and Brock plays host to an evil alien symbiote named Venom can only mean more outlandish trouble for our wall-crawling hero. This game takes classic superhero melodrama and unashamedly runs with it. After the game's mysterious opening sequence, you begin your heroic adventures in New York City. You start by foiling a bank heist and then move up to greater challenges like evading a missile-firing police helicopter that chases after our framed hero. Later, you'll fight swarming lizardmen on top of a rushing subway train and battle alien symbiotes in the Daily Bugle. All told, there are eight main locations, like Manhattan's rooftops, a high-rise bank, and the New York City sewer system, making for around 30 3D levels in all. Gameplay primarily revolves around platform jumping, a little stealth, and beating up lots and lots of bad guys. During your adventures, you'll meet fellow heroes like Daredevil, Black Cat, and the Human Torch who'll offer tips and villains like Scorpion, Rhino, and Venom who'll beat you to a pulp if you're not quick with your webshooters. No matter how smartly you play, be ready for some hassles--the game uses a save point system instead of letting you save when you choose. Game designers seem to ignore the fact that in the real world, not all gamers have the luxury of playing for long, uninterrupted stretches until they can reach a save point or the end of a level. At least you can tackle the game on four different difficulty levels, including a "kid mode" that simplifies the controls and gameplay for the younger set. To foil villains and save the day, you'll employ around 18 moves. For simple problems, a number of simple solutions are on hand (or foot): You can jump, grab, punch, and kick your way out of the game's lesser binds. Thanks to that fateful spider bite, Spidey can perform all these moves with extraordinary strength and agility. These core moves can be linked into combos, like jumping punches or the "grab and kick," where you sneak up behind a villain, grab him, and then unceremoniously give him the boot. Of course, Spider-Man's chief claims to fame, other than running around New York City in bright tights, are his masterful web slinging talents. Here's where the game's combat gets interesting, thanks to Spider-Man's arsenal of clever web weapons. You can sling webs that temporarily enmesh enemies or flick distant switches. If standard punches aren't working for you, you can create spiked gloves out of your webbing for added damage. You can borrow a page from Captain America's (comic) book and create your own web shield for defense. For pummeling villains from a distance, you can launch balls of webbing at them. If that doesn't get their attention, you can shoot a web line at them and yank them in the direction of your choosing. No matter what approach you use, you'll find that enemies aren't overly bright; bad guys rely more on brute force than anything else. "Mindless thugs” indeed. As clever and entertaining as these diverse abilities often are, they don't get their full due because of the game's awkward controls. Like many console ports, Spider-Man does little to take its new PC audience fully into account. You can control Spidey with the keyboard, a joystick, or a gamepad, though your controller of choice should preferably have at least six buttons. You'll need a spider's agility to master the keyboard approach, though it grows a bit easier with time, and a joystick can feel clunky and unresponsive. A gamepad is your best bet since that's what the original PlayStation game was designed to use. It's no secret, though, that many PC gamers don't own a gamepad for their computer since so few PC games require anything more than a mouse and keyboard. If you decide to use the keyboard, you won't be able to use mouse-look, which is shame since that would dramatically improve gameplay. As it stands, to aim accurately at distant targets you need to activate a special targeting cursor that you can only move with your chosen controller. Ideally, a small cursor should have been present all the time to help orient your character and aim. No matter which controller you use, Spidey only turns in set increments instead of using a smooth range of motion, which feels unnatural and makes viewing specific areas or moving to them harder than it should be. It can be quite the challenge to make Spider-Man do anything a spider can. Like the controls, the camera needs more work. Overall, it does a fairly good job of following our hero, especially considering that he can run on floors, clamber up walls, and zip up to ceilings on a whim. Still, walls and objects will often block your view, sometimes making spotting enemies too difficult and falling off of skyscrapers too easy. Also, when you move Spidey onto a ceiling, the camera sometimes reorients itself so that you view him from directly above instead of slightly behind, thanks to a temporarily translucent ceiling. The effect can be a bit disorienting when Spidey repeatedly switches from floors to walls to ceilings. Spider-Man's simply textured, blocky graphics and muddy cutscenes are distinctly underwhelming, if not outright poor. Some of the settings are bland and boring too--the dark, drab sewers in particular are overused. Still, the graphics do at least evoke the look and feel of the classic Spider-Man comics and cartoons. The same holds true for the game's audio. The familiar opening theme song, updated from the '60s cartoon series and featuring an incredibly catchy bass riff, sets the right mood from the very start. Spider-Man cocreator Stan Lee narrates the game in his authoritative style. Lee always sounds like he's having fun with his creation and doesn't take it dreadfully seriously. When he describes Peter Parker as a "sometimes neurotic" hero, you know that the writers aren't afraid to gently laugh along with you at the essential silliness of the game's story and superhero conventions. It's all good-natured fun, though. 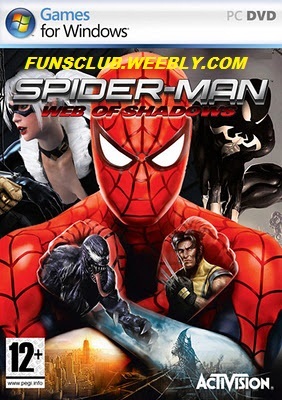 It's a shame that more time and effort couldn't have been put into making this Spider-Man port better suited to the PC and the PC gaming audience, as well as improving some problems that hurt the original game. The awkward controls and camera in particular often take the wind out of the game's sails. At its best, Spider-Man immerses you in the colorful, enjoyably implausible Marvel Comics universe, and swinging between skyscrapers and firing off webs offer up plenty of adventurous, if shallow, thrills. If you've ever wanted to play hero for a day, Spider-Man will let you, but be ready to fight with the game's weaknesses as well as its villains.